During the recent Elk Grove City Council meeting there were comments from the Vice Mayor that were unfavorably interpreted by several observers. 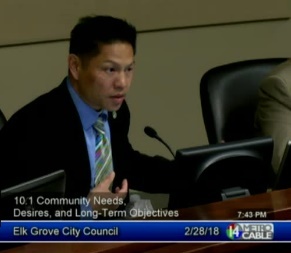 The comments were made by Darren Suen who implied a substantial sales tax hike paid by Elk Grove consumers was needed because while some roads and streets in the city could be maintained because of Mello Roos fees, other neighborhoods, streets and roads in older areas of the city that were built prior to 2006 were out of luck. Suen took this position in response to comments made during public comment during a hearing on a proposed sales tax and were made by Lynn Wheat. A longtime smart land planning and responsible financing advocate commented that the city's proposed sales tax hike was the result of the city council's snotty and reckless use of taxpayer money, specifically funds from the city's general reserve. In this edition, Wheat discusses Suen's comments. If the City Council says we need a sales tax increase because the freeloaders don't wanna pay their fair share, then so be it. There is a purpose and a vision for every dollar the City Council spends. I don't care if my property taxes, gas taxes, and sales taxes go to other purposes than maintaining the roads in my neighborhood, because I am a pre-2006 freeloader and I get what I deserve. Of course, Lynn Wheat was not given a chance to refute Darren Suen's comments. That way, any given council member can always have the last word, whether he/she is right or wrong. Such a model of governance!